I think this brow product might be an instant classic. I have brown hair, brown brows and the brown color was perfect for me. The small wand is easy to maneuver and use on even my teeny brows without making a mess. The color is subtle, and the bristles make it easy to feather brows into a fuller shape. The gel holds all day and my brows look totally natural. Plus, at $16, it's affordable. I'd recommend this product to anyone looking to fill in her brows in a natural-looking way. This brow mascara definitely lives up to all its claims. I adore how easily it can whip my brows into shape. The trend is definitely moving towards unstructured, more natural-looking brows, and this will help women achieve that. It combs them into perfectly feathered shapes and doesn't look at all like you're wearing anything. It holds all day, too. My only qualm is that this is really for women w...read moreho already have nicely shaped brows. I don't have much in the tail department and this can't do much to fix it. But for days when I don't feel like filling in my eyebrows with pomade, this makes me feel put together. Instagram & YouTube were right! 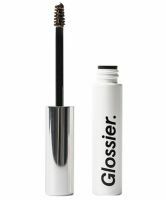 I'm a sucker for products I see on social media & Glossier Boy Brow is no exception. I actually have nice, thick brows & I think it's because I didn't start tweezing & waxing them until I was in my mid 20's (I'm 40 now) & I do all of my own brow work after never being satisfied with the results when I'd pay someone else to do them. Even though my brows are thick I keep them neat & trimmed & get a ...read morelot of compliments but they can always be better, right? I don't have to go hard with brow products to fill in any sparse areas, except for a little bit at the tail ends, but I do like for them to look neat & for the hairs stay in place all day so I always use a brow gel for this. Back in the day, even before I began tweezing & waxing, I'd use hairspray or gel on an old toothbrush, eventually investing in a lash/brow comb for this. Then I began using clear mascara (hello Maybelline Great Lash!) & finally moving on to ABH clear brow gel. Around this time I discovered Benefit's Gimme Brow, which I used for years. Once Glossier hit the scene I was intrigued with their skincare products & then I stumbled across a YouTube video featuring Boy Brow. After that I was seeing it everywhere & figured there's gotta be something about this product that makes it stand out from the rest & I placed my order. Boy oh boy am I glad I did! This brow gel is amazing! From the fabulously tiny brush, the "stay in place all day" formula & the shade that matches me perfectly I cannot see myself using any other tinted brow gel for a long time to come.